We had been married only a few months when we entertained my parents for dinner. A downpour had flooded our basement apartment and now a sump pump in one corner of the dining area emitted a constant drone. With a limited number of electrical outlets, a tangle of extension cords fueled our appliances. One ran surreptitiously beneath a throw rug lying between the dining room and kitchen. During the meal, one of the table knives fell to the floor and touched the plugin on the extension cord. With an electrifying buzz the end melted. It should have gone in the trash right then. Yet from thrift or sentimentality, I hung on to that electrocuted knife. It has survived four moves and each time is relegated to the back of the drawer because I may need it at some point. 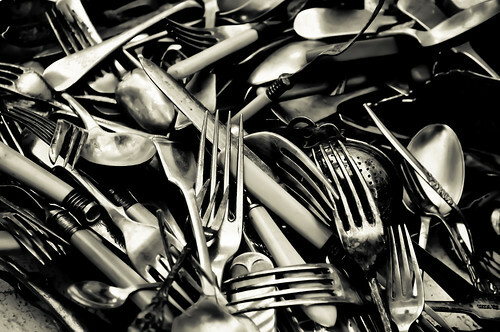 Every time I clean the crumbs out of the silverware tray, I consider throwing it out. But turning that blunted knife over in my hand, I remember my anxious preparations for that dinner, the adjustments of that first year of marriage, the challenges of basement apartment living. I can’t bring myself to throw it out. Even flawed, it completes the twelve-piece set of silverware my mother and aunts gave us as wedding gifts. It doesn’t look great, but it can still be used to spread butter or jam, or pry a stubborn lid off a jar. If push came to shove and we needed a knife to complete a place setting, I could always use it. Maybe I keep it because it reminds me of my heavenly Father’s attitude toward me. I’m flawed. I’ve fallen, lost my edge, been bent and battered. But God hangs on to me. I complete his plan. He has redeemed me and he’s not letting me go. This cracked me up a bit simply because I come from a family of pack rats, er, collectors. I don't have anything like your knife, but it sounds as if it's still useful, so you just keep on keepin' it!